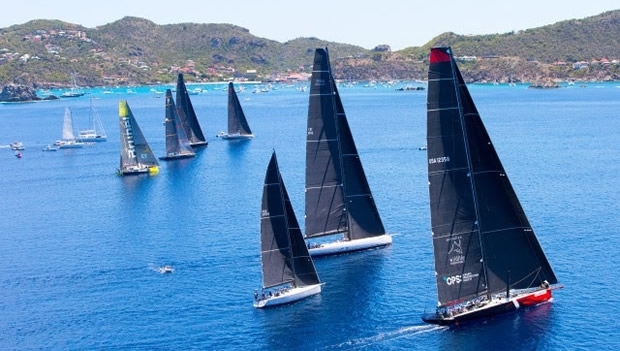 Today's final race at Les Voiles de St Barth was riveting to watch, especially during the first beat and at the finish. The wind, like yesterday, was light, but unlike yesterday, just strong enough for officials to actually get off a race, and that pleased the hundreds of sailors competing here. Going into today, which was the fifth day of the regatta and the fourth scheduled for racing, many were in precarious positions on the scoreboard and needed to outwit their closest competitors to pick up a position or two to make top-three. Others had turned in perfect score lines, but knew today's fickle winds would leave them vulnerable. The course – at 20 nautical miles for Maxis 1 and 2, CSA 0 and Multihulls, and 17 miles for CSA 1 to 4 plus Melges 24 and Class40 – ran counter-clockwise around the island and was a good choice for many reasons. It was an opportunity for the sailors to take in the beautiful vistas of St. Barth; it gave officials the option to shorten course if needed; and it incorporated all aspects of a good race course as far as reaching, beating, running, and navigating around the rocks and small islands off the coast. At the start, the six-knot winds, combined with current and slow-moving sailboats that became obstacles, made positioning a critical factor in establishing early leads. The Maxi 72Momo and the TP 52 Vesper were perhaps the best examples of this, establishing huge margins in their classes (respectively Maxi 1 and CSA 0) by sticking close to the shoreline on the way to the first mark at Roches Roubes. Unfortunately for Momo, which led its class the entire way around the island, a huge windless hole awaited them near the finish, and the Maxi 72 Proteus, with which they were tied for first place, was able to sail around them and put 20 boat lengths on them in the end. Maxi 2, Farr CM60 Prospector, co-owner Paul McDowell: We went into the last race of the regatta tied for first with the Volvo 65 Team Brunel, sailed by Boewe Bekking (second in the last Volvo Race), so we knew we had a tough challenge to beat them. It was a pretty straightforward thing: either we beat them and we win the regatta or they beat us and they win. It was a match race for us; although, they are quite a bit faster, so we just hoped to stay as close as we could and find a way to get that extra two or three minutes to win the regatta. This is our very first time to Les Voiles. We've done a lot of the ‘bucket list” regattas, but this is by far the most fun we've had. It has been spectacular, and to come out with a victory is a tremendous success for us as a Corinthian team (representing Shelter Island Yacht Club from the United States). CSA 1, Melges 32 Lazy Dog, skipper Sergio Sagramoso: “I can't think of a better place to have no wind; I was kind of hoping there'd be no racing (laughs). But really, we fought the whole way today; Dingo (which finished second) and us, we switched places a lot, and we did not know until the last second. We were first almost to the end, but then we sailed into the hole. They beat us over the line but we had enough corrected time to beat them. Luckily, we were at the beginning of the hole and were able to escape easily, but most of fleet was there for an hour.